I've been posting a lot about sugar. We know that sugar isn't a great choice. We know that donuts are not a super food. We know that cookies are not the key to longevity. We know that candy isn't a vitamin. We know all these things, but if you pay attention to the marketing it is easy to forget. It is January and there is already Easter Candy in the stores. Whoa capitalism! Take the reigns! We normalize the overconsumption of sugar to the point where WHO knows what is normal. We measure ourselves by the people around us. She is skinny and had two cookies... so I am practicing restraint by having my one - OR - well my signf. other eats a bowl of ice cream EVERY NIGHT and I only have a half a scoop every other night, so that's good - OR - you're right commercial on tv I SHOULD treat myself. We have awkward measuring sticks. This year was the first year I stayed off all refined sugar for the holidays. No sugar, no flour, no chips, no corn tortillas, no candy, no baked goods. I did still have wine... and I also wrapped some dates in bacon (my specialty). This is a big deal for me usually going home to Michigan AND holiday season means the ULTIMATE CHEAT MEAL STREAK! Pockets full of Peanut M&Ms, Peanut Butter M&Ms, AND! Reese's pieces (seriously, I put them in my pockets for easy snacking access, great combo). SO GOOD. SOO BAD. I wrote more about that in my first post "SUGAR, SUGAR, SUUUUGARRRRRRRR | PART 1". So the question = how'd it go? The answer = really well. I did have moments of gazing longingly at things I could not have, but then the moment passed something else happened and I forgot. The hardest time I have is when someone ELSE thinks I should be eating a treat and THEY feel put out by me NOT doing it. This doesn't happen too often, but it does happen. I was at my Uncle's house and he ALWAYS has candy out and about. My sisters and I were doing a quick visit and my Aunt and Uncle always like to have something out for you to nibble on (very hospitable). Unfortunately, all of the things out were not things I could eat - now this was okay - because after his house the plan was to make dinner BUT my Uncle really felt like I should be eating something. And then he gestured again. These types of situations are the tough. You want to do the socially normal thing. You want the person to know you appreciate their efforts, but this time my health was the priority. Eventually he stopped gesturing, but as we were leaving he said "well I hope you are eating", I reassured him I eat plenty, and then he told me he was proud of me (which was nice). Social situations are no joke. The one thing that I think has been THE MOST beneficial during this time is the mindset of SUGAR IS NOT A CHOICE. I am currently one week away from four months of eating this way and I am toying with the idea of keeping with it for all of 2015. I might keep that goal to myself... we shall see. Blood sugar regulation is no joke. The other night I was staying strong on my NO SUGAR promise and I found myself gazing at delicious looking popcorn. My sister and her husband gifted it to my Dad for Christmas. It was a Chicago Mix - cheese and caramel - I was staring at two pieces and picturing the delight of eating them. But then I thought about the fact that I haven't had ANY refined sugar in about 3.5 months. The popcorn WOULD have an impact. ONE - I'd be going against rules that I set for myself. There is something super satisfying about accomplishing what you commit yourself (to yourself) to. TWO - It WOULD spike my blood sugar and that is what I have been looking to avoid. SPIKE. So let's talk about this. What is a blood sugar spike? What happens in the body? Why is it a bad thing? It likes things to exist within certain perimeters. Like your thermostat. You set the temp to 70 degrees. It heats up to get there - stops - heat drops - it heats up again. It just keeps on keeping on trying to maintain that 70 degrees. So let's talk about this in relation to blood sugar. Blood sugar is the amount of sugar in the blood. We are always meant to have some sugar in the blood, but we are not meant to continually spike that amount. If you think about it... like really think about it... we humans haven't had sugar in our diet for a very long period of time. In 1821 the average amount of sugar was 10 pounds per person per year. In 1970 it was 120 pounds per person per year. In 2004 it was 141 pounds per person per year. And now it is estimated to be 170 pounds of sugar per year. Let that sink in that is an additional 160 pounds per person in about in what is really a short amount of time. The thing that makes me the saddest is that this type of overconsumption is normalized in our society. Treat yourself! You deserve it! Etc. Etc. It makes me angry and it takes a lot to make me angry. So, like our thermostat being set at 70 our blood sugar has a particular place it is comfortable. If it goes HIGHER the body regulates, if it goes LOWER the body regulates. Most people are aware of the hormone that lowers blood sugar aka insulin, but do you know that insulin's primary job is actually to get energy into the cell? So insulin is now used more frequently to mitigate the damage of too much sugar in the blood which is tiring for the body. There are 3 primary organs that are involved in this process - the Liver, the Pancreas, and the Adrenal glands. Here is a basic (basic) explanation of what happens when blood sugar is spiked. So let's say I was seduced by the caramel/cheese popcorn. I grab a handful and crunch in delight. My brain is happy as quick energy surges into my body, dopamine pathways light up and I am all heck yea! It does not take long for the popcorn to break down and make it into the blood stream. My blood sugar soars and the body takes action. It is like OH NO YOU DIDN'T! TROOPS LET'S GET THIS REGULATED! And the pancreas springs into action. It releases the hormone insulin (hormones are messengers) insulin is now telling the cells HEY WE HAVE A LOT OF SUGAR HERE I NEED YOU TO LET IT INTO YOUR CELL WALL. This message needs to be received by insulin receptor sites for the sugar (aka glucose) to go into the cell and be converted into glycogen (stored energy) in the liver. The muscles can also take in some glucose and convert it to glycogen to be stored (which is great for intense workouts or sprinting). But, there is only so much room. Eventually everyone is full up on their need for stored energy and the rest of the glucose gets converted into triglycerides and cholesterol for storage. So that weight you carry around that is stored energy. Fun. Blood sugar goes up, insulin is released, it tells the liver and muscles to let the glucose in by connecting with the receptor sites, glucose gets in and gets converted into glycogen aka stored energy. And remember carbs are also sugar because they get broken down INTO glucose so you might think... huh... I don't eat much sugar... but do you drink OJ? Do you eat bread? Enjoy pasta? All these things become glucose and RAISE the blood sugar. Over time the system goes out of whack. Insulin is being pumped out like crazy to normalize blood sugar and the receptor sites begin to need more to respond correctly. Also too much sugar in the blood leads to AGEs (advance glycation end products) which are basically proteins or lipids (fats) that become glycated. Which means they are STICKY. You now have sticky proteins floating around. These sticky proteins can STICK TO RECEPTOR SITES! And from all of this you start to become insulin resistant. Which means the receptor sites are not getting the message. That means your pancreas is doing it's part, but the message is not being heard so it keeps on pushing out insulin (yes this is tiring for the pancreas). So now, finally, after a boatload of inuslin, blood sugar drops - but - in this non normal world it drops WAY low. And the body is like CRAP! WE NEED TO GET THIS REGULATED (once again). The pancreas leaps into action and releases glucagon which is the opposite of insulin. Glucagon is a hormone (messenger) and it tells the liver to release the stored energy (glycogen) and convert it back into glucose (raising blood sugar). And that is where the adrenals come into play. Now cortisol AND epinephrine are released as well to try to spike the blood sugar back up. Cortisol and epinephrine are both hormones that they are part of the flight or fight response. You might notice your heart-rate go up because you are in a stress response. So now we have your pancreas, liver, and adrenal glands working OVERTIME trying to regulate blood sugar - and those organs have a whole host of other things they need to be doing as well - but here we are working them to bone. Riding a sugar roller coaster. Eventually something is going to give. The liver goes caput (potentially leading to fatty liver disease). And it is bad news bears for everyone. Which is why blood sugar regulation disrupts ALL aspects of human physiology. It hits your energy, the integrity of your tissues, the balance of your hormones, AND your brain health. It is one of THE most important systems to get back in line to begin to tackle other pieces of health. If you want to drop weight you need to get this under control, it is THE sustainable way to get weight off and keep it off. If blood sugar regulation is not working properly then health CANNOT be achieved. Which is why in the end I did not eat the popcorn. Getting this system in line is a huge undertaking and a huge priority. The instant gratification of crunch, crunch, is not worth sacrificing the long term benefits of having a system that works properly. The more I feel good. The more I want to feel good. EVERYONE SHOULD GO TO A NUTRITION WORKSHOP BEFORE THE HOLIDAYS (OR MAYBE NOT). In my "normal" everyday life I do not eat sugar. At. All. Now it took a while to get to this point (aka a LOT of ebbs and a LOT of flows), but now I can say with confidence I do not eat sugar (yes I do consume alcohol, but that is another story). When I worked in an office there were ALWAYS (always... always) treats coming in through the door. People would bring in donuts to share, there would be homemade cookies, pies, brownies, and more!! There were ALSO candy dispensers that were always stocked full o' tasty treats (gummi bears, m&m's, reeses peices, skittles, etc). My rule was to just NOT partake. Just don't do it. And I never did. Things become easier when the rule is absolute. I would however sometimes get into a gluten-free treat kick. French macaroons, gluten-free cupcakes, gluten-free brownies, gluten-free cookies, coconut milk ice-cream! Now, NONE OF ME thinks the absence of gluten makes ANY of these treats "better" or "good" sugar is still sugar in whatever form. I would treat myself one day... and then I wanted to treat myself the next, and the next. Once a week would become twice week... to three times a week. About three months ago I tweaked my diet a bit and HAD to take out the sugar and the chocolate (I'd been allowing myself 70%+ dark chocolate). In three months I have had a bit of honey, but that is it. The reason for the diet tweak is therapeutic, I am working on my digestion and sugar is trouble for a lot of digestive issues. It feeds some of the bad stuff (if you have bad stuff) in your gut (more on that later). And you know what? It has been awesome. My skin looks better, I've dropped weight, my energy/mood is better, pretty great right? So now let us fast forward today. Michigan. My home. 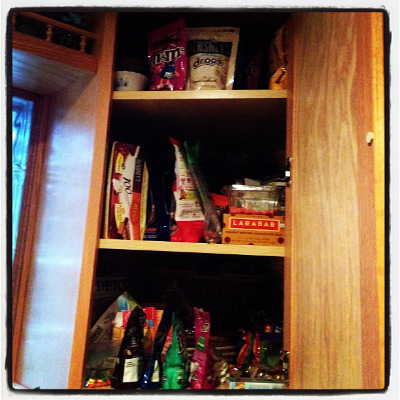 The cupboard of death (and delight)! I come to Michigan about four times a year and when I am here I typically throw a lot of the rules to the wayside. The way I live in Seattle I say ... eh WHATEV. And do what I want in Michigan. My parents are a fan of candy. You can see the pictures. There are cupboards just lurking with tasty sugary treats. Now not everyone has a thing for candy. I do. And I don't want just a "taste" I want A LOT ! The drawers of merriment (and pain)! In Seattle, I follow the first rule of self defense aka don't be there. In Michigan, that isn't possible so I indulge! At first it is great... and then it isn't... and then I feel pretty terrible. It is my special time!! The weekend before coming here I was at an onsite nutrition workshop and blood sugar regulation was a HUGE topic. Learning what it does to you internally when you overload your system was really impactful. Like really impactful. It gave me the resolve to say no to sugar for the holidays, for my trip to Michigan, and for the foreseeable future. Like I said I do REALLY well when I work in absolutes. Grey areas are where I get tripped up. Michigan has been a grey area, but no more my friends no more. Next post I will be getting into the nitty gritty of what good blood sugar regulation looks like... and what an overworked system looks like and why it is harmful for your awesome body. I have known about nutrition for a long time. What is surprising is how much there is still left to learn. So much! You know how sometimes you hear something in a different way and it just LANDS? You now GET what you have known in a way that actually affects you? With that in mind I want to share with you a two points. I just want you to THINK about them. Let them sink in and understand what they mean. I am curious to know how you might be impacted. I was just at an onsite workshop for nutrition there were around 50 people in the room and the question was asked "how many of you have digestive problems?" - almost all the hands went up. Which really has me reflecting on point one. I just learned a new fact. There is so much going on in digestion that it is literally blowing my mind. I KNEW having proper digestion was important, but I had no idea HOW big a deal it really really is. Soo many little pieces that can go sideways. My first post was about the importance of chewing. My second post was about the importance of stomach acid. This post is mini-post on cellulite. What I just learned is that cellulite formation is a symptom of poorly digested fat. When your body is not digesting properly the signals are not working properly. Which means that you don't produce the proper enzymes you need and the gallbladder isn't triggered to release the appropriate amount of bile. And you NEED bile to fully break down fat. When this does not occur fat can build up in the lymph system which is where it appears as cellulite on the body. Ah-mazing. When we start getting digestion back on track the lymph can CLEAR UP and reduce the appearance of cellulite on the body. You know that feeling, that burning in your throat. That feel of acid warming the base of your esophagus as if to say HI! HOW ARE YOU! I EXSIST! You might chalk it up to some spicy food you overindulged in (nachos ARE delicious) or it might just be a pretty normal occurrence for you. "I AM CURSED," you might think and just reach for some Pepto or Tums or some other type of calming agent. Calm the acid cure the symptom. Rinse repeat. But did you know that burn is often because of TOO LITTLE stomach acid rather than TOO MUCH? So here is the deal. Continuing from my post of CHEWING YOUR FOOD. The next step in digestion is the stomach. The stomach is a powerhouse that crushes food into tiny food bits so that it can go through the rest of the system and be optimally digested and utlized. It is meant to be highly acidic in there so that it CAN break down your food. You chew your food, it goes down the esophagus where it encounters the esophageal sphincter which opens up to permit the food inside (I know, I know "sphincter" what a word). The food is now in the stomach. The stomach goes into action releasing a ton of different gastric juices from tiny gastric glands in the its lining. This breaks down the food even more and turns everything into a paste we call chyme. When the chyme is acidic enough it triggers the pyloric sphincter to open up and allow the chyme through to the small intestines for further digestion (more on that later). When you have LOW stomach acid this whole process goes sideways. The food doesn't get fully digested from the acids so it sits in your stomach. What happens when you leave food in a warm place? Well. Not good things. Proteins putrefy, fats go rancid, and carbs ferment. This means that the mixture in your tummy starts to bubble up and though it IS NOT ACIDIC enough to trigger the lower sphincter to open it IS ACIDIC enough to burn your upper sphincter at the end of your esophagus. Which is what you feel. And then you take some sort of calming agent that DOES relieve the symptom, but doesn't help food to get to the level of acidity it needs to be to be in able to continue the digestive process. This is bad news. The food eventually continues through the system, but not fully digested. Having protein putrefy produces acids that actually hurt the mucosal lining of your stomach which allows microorganisms such as h-pylori to exist. This on a chronic level is terrible for your gut as h-pylori leads to ulcers. No one wants those. Here is the thing. There are SOME people with legitimately too much stomach acid, but they are the anomaly. Much more common is to have too little. I know! Crazy! But if you think about it, it really does make sense. You might want to check out this book "Why Stomach Acid is Good for You" if you are interested in learning more. Chew your food. No really chew it. One of my LEAST favorite words is masticate, even writing it gives me chills of ewwww. That said. It is really important. Digestion begins in the brain. You see the food. You smell the food. You want the food and your body is like YEA FOOD! And it begins to produce saliva (another gross word). This is GREAT! Salvia is a special cocktail of electrolytes, hormones, and enzymes (with names like salivary amylase). We like the salvia because next up you put the food in your mouth. Which brings me to my earlier point. This breaks down the food and it mixes with the salvia and the aforementioned salivary amylase which is fantastic at breaking down carbohydrates. If you do not chew. You get big food chunks. Big food chunks are bad because the rest of your system is not really meant to handle them. And as your food chunks go down your system (next stop STOMACH) they are not fully being broken down. More enzymes are thrown at the chunks by the pancreas TO NO AVAIL! Your chunks soldier on to your small intestine where the carbs (aka starch) are now UNDIGESTED and continue on to the colon that way (gross)! Well this bad because this type of starch FEEDS unwanted colon passengers like Candida (Yeast Overgrowth) and other kinds of dysbiosis. The moral of the story. Pause, slow down, chew, and enjoy your food. For me. Because I wrote this post with words I hate. Because I love you. Because this is important. MORE TO COME ON DIGESTION and ACID REFLUX... get excited. Sure. I know chips aren't the best. Yeah, yeah, yeah I know that processed food isn't ideal. But c'mon I am living a life. I work out most days. I don't drink soda. So that's good right? I am all for people enjoying their lives, but do you know why nutrition is so important? It is how you feed your body. And, your body is made up of cells. You are feeding the cells, which make up the tissues, which make up the organs, which make up systems, which make up you. Your cells NEED certain nutrients to FUNCTION. Okay so the wheels are beginning to go, but WAIT, there's more! This ALL starts from nutrition, which is why I find nutrition fascinating and which is why it is TRULY the foundation of what creates you. Ay! Look up there at my Menu Bar! I am taking clients! I know you are excited. I just added a FREE CONSULTATION page to my site, get to it by looking up at the menu or clicking here (so many options). The cool thing is I added in an Appointlet integration which allows you to schedule RIGHT ON MY CALENDAR (be amazed). I am right in the THICK of my Nutritional Therapy Training course and have just completed my client evaluation module. I learned how to give people a Nutritional Assessment Questionnaire which is pretty rad. It helps to pinpoint what is going sideways with different body systems and focusing efforts on what is the highest priority for YOU. And it is all about you. I am combining this new skill with my already impressive mass of knowledge in HEALTH. NUTRITION, and SPECIAL DIETS (oh jeez, I know so much about special diets). To be a lethal healing machine! That's right LETHAL HEALING. So the doors are open. I am ready to work and for you! We are built to survive. Human beings are super resilient. It is somewhat incredible the amount of shiz we can do to ourselves and still be breathing. When I first moved to Seattle I was walking down the street talking to my Mom on the phone and this woman approached me asking for money. She had a very whiney, desperate sounding voice... if you live in Seattle you might have been propositioned by her yourself. Anywho. I was on the phone with my Mom, so I did my best to avoid her and she turned from desperate to feisty and aggressive in under a second. My Mom overheard her and was questioning my move to Seattle. The point is that now ELEVEN YEARS LATER (!!) I still see that woman. She is still alive and kicking. I cannot imagine her life has been super cushy, but somehow her body keeps ticking and she keeps roaming the streets. Amazing. We are meant to survive, but how do we thrive? I heard a quote the other day that I wanted to share "survival is a constant struggle, and some people confuse it with living." How do we push beyond surviving and fully engage with living? From a nutritional perspective lets take a look at recommended doses for vitamins and minerals. You are all somewhat familiar with RDA yeah? Recommended daily allowance. Have you ever questioned what it is based on? Recommended for who? And HOW is it that EVERYONE can have the SAME recommendation? Do you think a 6 foot 4 inch 250lb man would need the same allowance as a 4 foot 6 inch 125lb woman? Not only do people need different amounts of nutrients, but people absorb these nutrients differently. And the recommended allowance is just a starting point. It is what we need to SURVIVE not what we need to THRIVE. Every cell in your body is nourished off of what you put in your mouth and you NEED a certain amount of food to keep it going, but you need a certain quality of food to keep it running WELL. It is like a car. What would happen if you took the oil in a deep fryer and put it in your engine? Not good things. Your car would probably run for a bit with the crappy oil in it, but then it would die a sad death. You can keep running for a bit with not awesome choices, but you might start noticing some symptoms... and then you might notice those symptoms increasing. Until something goes so wrong it is unavoidable to do anything but seek out help. Butter on all the things. I have been reading a lot about butter. When I say BUTTER what do you think? If you do use butter, how do you use it? How often? ...some delicious butter coffee nom nom nom omm. Kerrygold Butter is an excellent choice. Okay, lets go back to our butter contemplation. As you can probably tell from above, I am a fan of butter. More correctly I am a fan of butter from happy cows aka grass fed cows living off the land like they were meant to do. Fortunately for us this type of butter is pretty easy - and affordable - to come by these days. It rocks in providing us with fat-soluble vitamins (most notably A, E, and K2). Vitamins are needed to keep our bodies functioning and the problem with a lot of our food is that it lacks proper nutrients. We are a society of good enough rather than how do I optimize the eff out of everything which vitamins help us to do. You NEED fat to absorb vitamins. Vitamins A,D,E, and K are ALL fat-soluble vitamins, which means you need fat to be able to process them effectively. Otherwise they are un-usable by the body (lame). Butter vs. Margarine. Butter actually lowers our risk for Cardiovascular Heart Disease in comparison to margarine which seems to raise our risk. When I learned this I was like WHAT how are they able to call margarine "heart healthy"??! How?! You can check out more at PubMed here. Butter is a great source of CLA (Conjugated Linoleic Acid) which has been linked in various studies show it to support better body composition/metabolism and is even sold as a weight loss supplement. Lastly, butter is amazing for the brain. It helps with clearing brain fog, it helps in thinking, it helps in satiating your body. Anecdotally, I can tell you that upping my butter intake has only helped me improve my health and I have not noticed any negative side-effects. Send me a note to ask me more if you desire. As with everything, people are people and some people need more fat, others need less. Butter is a really interesting and tasty tool in a your toolkit and if you haven't thought about it, or played with how you consume it - I recommend giving it a whirl. I never thought much about food. I never thought about what the human body needs from food. I never thought about the fact that to run this body and to run it well - I needed to nourish it. I understood that some people “ate healthy”, but that was just fiction something to be made fun of on sitcoms. The people that were granola and kooky “ate healthy” not REAL people. I grew up in a small town called Ortonville and though I think my parents did their best to feed us “healthy” food, they were slightly misinformed. We had a garden, which was awesome, but we also had a BOAT-LOAD of processed food and to be honest that was the majority of our diet. We never ate as a family. The only time we gathered together for meals was holidays and that was the only time I was exposed to "side dishes". My Dad was the cook and he would make one thing and only one thing for dinner. This could be burrito pizza (his invention), spaghetti for days, chili, or a taco salad. I had two sisters and the three of us would sit at a table together facing a window as my Mom and Dad sat in the living room and watched TV. This was how we did dinner. As we grew up dinner became less of a thing and often we were allowed to make our own food. I never really understood how cook real food - so I’d stick to baked potatoes and noodles (LOTS of noodles). You know, good fat-free, options. We’d all pack our own lunches for school. Typically peanut butter and jelly - some sort of fruit snack and then maybe cookies with a juicebox. PACKED LUNCHES EQUAL HEALTH LUNCHES, right?! As I grew older I thought it would make sense to try and go through school without eating much (PORTION CONTROL). I remember not bringing a lunch and purchasing one singular oatmeal cream cookie and slowly eating the whole thing. I’d then go home and eat SO MANNY BAGELS. Bagels are fat-free = healthy! Then I'd spread on margarine = a healthy choice and I might also add low-fat or better yet completely FAT FREE cream cheese to garnish my - at least - 2 bagels. Healthy, healthy, healthy! I have a vivid memory of one night really craving some chips, but choosing a half a loaf of potato bread (fat free!) instead - I was so proud of myself. If you had asked me, I would have said “I eat pretty healthy” because I thought I did. I really truly thought I did. I thought it was all about portion size and I knew sometimes I went a little nuts with the amount of food that I was consuming, but all in all - I didn’t do too bad. I believed that working out was the solution. And man. I felt awful. It would take me a long, long, LONG time to learn how to properly nourish my body and understand what "pretty healthy" actually means. To understand what food to eat, how to enjoy it, be nourished by it, and not constantly be hungry. I had to discard SO MUCH that had been ingrained in me and realize that being the kooky sitcom person is in fact sustainable. So my question to you is how do you define "pretty healthy"? They were made of frailer stuff than I. I who was doing AWESOME on my 4 to maybe 6 hours of sleep. I WHO WOULD RULE THE WORLD. If I could just stay focused long enough... and not fall asleep on my desk... and not... zzzzz.... what? what just happend? Looking back I want to shake young me - SLEEP IS SO IMPORTANT - I want to stress this so hard that you tell me to shut up, you tell me ANNETTE WE GET IT, CALM YOURSELF! Sleep is magic for your body. People pay a crazy amounts money on powders, supplements, cleanses, detoxes, etc. when a more effective cure is free and overlooked. Sleep is way more powerful and impactful to your health than you realize. Sleep affects how you see the world. It affects how you make decisions. It affects your mood. How you recover. Aging, your digestion, how you learn, how you retain. It affects weight loss (or lack thereof). It affects your stress levels. Your focus. Your memory. Your ability to be patient. To be kind. To be grateful. Sleep plays into all of that. Mark Sisson over at Mark's Daily Apple wrote a great guide to sleep, worth a gander. 1) Get off your devices - do this at least an hour before you intend on going to bed. The light is stimulating and messes with your body's understanding that it is time to shut down. 2) Night time ritual - I recommend tea and writing. Dim the lights, make some tea, write down thoughts of the day, or a few things you are grateful for - doing this regularly will make your body understand ahhh this is the thing we do before going to bed. It is like a puppy, sometimes it needs to be trained. 3) Bring down the lights - transition into a more nighttime looking world. 4) Focus on breathing - calm your mind by sticking with your breath. Breathe in - count one, breathe out - count two, breathe in - count three, breathe out - count four, and so on until you reach ten - then repeat. Sleep is money on the table. Pick it up, put it in your pocket - see how awesome it feels. But sometimes you are sick of salads. Grab some veggies. Chop them up, put them in a pan, dash them with olive oil or coconut oil, turn that oven on and let 'em roast. I worked at a Tully's slinging coffee to the masses. One of my regulars was a Personal Trainer. She would always order an 8 oz Americano and we'd chat while I pushed buttons and pulled shots. The Atkin's Diet was back on the scene and we'd gotten to talking about the low-carb approach. I didn't know much about the diet, but scoffed at it on principle. I remember her saying, "Your brain needs carbs!" Yeah carbs! I agreed sticking staunchly to my eye-rolly disdain of anything low-carb. I had a lot of fervor regarding something that I knew little about. I should also mention that while my mind was screaming Atkin's = UNHEALTHY I had probably eaten half a bear claw and many many ounces of coffee and soy milk (because, you know, soy is healthy) and white chocolate flavor (because, you know, white chocolate flavor is... white chocolate). Point being - what leg was I standing on to judge anything? Answer: None. It is easy to get swept up in what is "healthy" vs. "not healthy". It is super easy to debate these viewpoints passionately with other people that will also debate them passionately, but what have you actually tried? That is where everything gets interesting. In my last post I talked about what comes first the belief or the shifting of behavior. The answer for me was both. I had to get to the point where I could begin to consider that carbs were not as necessary as I thought. Where I could look at Atkin's and other methodologies on the market objectively and where I could begin to experiment and try out different ideas, different plans, different thoughts and see what fit me. That point came from me beginning to question everything. I had always been raised that LOW-FAT was the way. Carbs shmarbs HOW MANY GRAMS OF FAT DOES THAT HAVE? I didn't care how many chemicals a thing contained as long as those chemicals magically rendered the thing I was consuming fat free. And you know what? I was always hungry. See: here. And this threw the whole system out of whack. So... IF LOW-FAT was "the way" - then why wasn't I seeing success? I had a lot to learn, eventually I found out eating carbs causes you to crave more carbs. EATING FAT is actually what is needed for brain function. So I started to eat fat. And I started to eat protein. And I started to get results. About 6 maybe 7 years ago I was in a play. It was a really bad play, but we had established an amazing sense of community. Our rehearsals were physical and long and we'd often bring snacks to share. It was around Easter and my FAVORITE in the whole world candy - ROBIN'S EGGS - were available. They are an amazing blend of malted milk ball and candy shell they just melt with such a wonderful sugary burst on the tongue - it is incredible. So these candies were there and I was NON STOP moving candy from bag to mouth. Oh the joy of mass consumption! After about 10 the joy was fading and the sickness was setting in, but I really didn't want to stop. WHY STOP? The pleasure of pure refined bliss was just moments away!! I remember turning to a fellow cast member explaining this and he just looked at me and was like - "Annette. Just stop." HA. I thought, HA. I KNOW, I KNOW, I KNOW I SHOULD! But I really didn't feel like I had control. Their mere physical presence spurred me on. If they existed where I existed HOW WAS I TO NOT CONSUME THEM?! WHO AM I!? A FICTIONAL CHARACTER THAT MAKES CHOICES BASED ON HEALTH?? HA! SCOFF! HA! Lately, I have been reflecting a lot on moments like this from my past and wondering what has shifted from then to now? What actually allowed me to stop? Knowing I should stop, wasn't the thing. Wanting to stop, wasn't the thing. Having a logical understanding that 30+ Robin's Eggs is not the way to a trimmer waistline and a greater sense of wellbeing, also was not the thing. I love the phrase "simple, not easy" and that pretty much sums it up. The way I got from point A to point B wasn't revolutionary, but it did take a lot of self discovery and a lot of understanding of what motivates my choices. Belief drives behavior which drives results - so what was I truly believing? And how could I shift that belief to be in-line with my actual priorities? And how could I create an environment to support the results I wanted? What things do you do that you KNOW you shouldn't be doing, but feel powerless to stop? What are you actually believing?